This pie is a bit of a time commitment, but what a showstopper! The recipe comes from the Sister Pie cafe in Detroit. Note that you'll need pie weights or a couple pounds of dried beans for blind-baking the crust. Also, if you don't have a broiler-safe pie plate (metal is safest), you will need a kitchen torch to toast the topping. They are quite inexpensive. Filling For filling: Preheat oven to 425 degrees . Prick sweet potatoes a few times with a fork, then wrap in foil. Place on a baking sheet. Bake until very tender, 40 to 60 minutes. Transfer to a wire rack to cool. When cool enough to handle, remove foil and peel off skin. Transfer sweet potato flesh to a food processor or blender; puree until smooth. Filling In a mixing bowl, whisk together sweet potato puree, brown sugar, cream, egg yolks, butter, cornmeal, cinnamon, vanilla, kosher salt, nutmeg, coriander and cardamom. Pastry and Topping To prepare pie shell: Unwrap pastry and place it on a lightly floured surface. Bang the dough with your rolling pin about 4 times, from left to right. Flip and bang left to right again. Begin rolling pastry from the center forward, using less pressure on the edge. Every few rolls, rotate the disc a quarter-turn. If pastry starts to stick, lift it gently and sprinkle more flour underneath. If the top gets sticky, flip the disc over. Continue rolling and rotating until the circle is 12 to 13 inches across. Loosely fold the circle in half and transfer to a 9-inch pie plate. Unfold dough and gently but snugly press it into the corners. If any dough hangs over by more than 2 inches, trim it with kitchen scissors. (Use those scraps to patch holes or bolster spots where you don't have much overhang.) Roll the dough overhang up and inward to create a thick rim, then crimp to seal. Transfer pie plate to freezer for at least 15 minutes. Pastry and Topping Preheat oven to 450 degrees and position racks on the center and lowest levels. Remove piecrust from the freezer. Tear off a square of aluminum foil that is slightly larger than the pie shell, and gently fit it into the frozen crust, loosely covering the crimped edge. Fill crust all the way up to the crimps with dried beans or pie weights. Bake on the lower rack for 25 to 27 minutes. Check for doneness by peeling up a piece of foil; the crimps should be light golden brown. Transfer to a wire rack to cool. After 6 minutes, carefully remove the foil and beans. Pastry and Topping To assemble: Reduce oven temperature to 325 degrees . In a small bowl, whisk together 1 egg and the water. Brush egg mixture over crimped edge of pie shell. Pour sweet potato filling into pie shell. Bake pie on center oven rack until the edges of filling are puffed and the center jiggles only slightly when shaken, 40 to 50 minutes. Transfer to a wire rack to cool slightly while you make the marshmallow-meringue topping. Pastry and Topping For marshmallow creme: In a stand mixer fitted with the whisk attachment, combine 1 egg white, the corn syrup and 1/4 teaspoon kosher salt. Beat on high speed until mixture is thick and almost doubled in volume, about 5 minutes. Reduce speed to low and beat in powdered sugar and vanilla. Set aside 1 cup marshmallow creme to use on the pie. (Use the leftover marshmallow creme as a dip for graham crackers or strawberries.) Fully clean and dry the bowl and whisk. 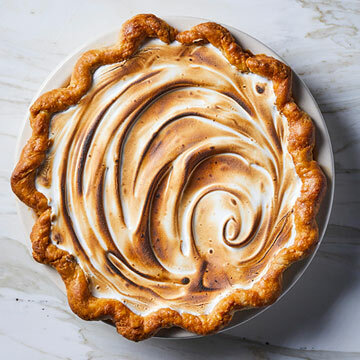 Pastry and Topping For meringue: In a heatproof bowl (such as the metal stand mixer bowl), whisk together 2 egg whites, the granulated sugar, cream of tartar and 1/8 teaspoon kosher salt. Place bowl over a pan of simmering water and continue whisking until mixture is warm and sugar is completely dissolved. Transfer to the mixer; whip on high speed until mixture is voluminous and shiny and holds a stiff peak. Pastry and Topping Transfer meringue to a medium bowl. Using a silicone spatula, gently fold in reserved cup of marshmallow creme. Scrape topping onto the center of pie. Gently spread it all the way up to the crimps and swirl it decoratively. Deeply toast meringue topping with a kitchen torch. (Or, if your pie plate is broiler-safe, preheat the broiler or heat the oven to 500 degrees and broil or bake until deeply toasted, about 3 minutes, watching the pie closely. Cool on a wire rack for 1 hour. Chill in the refrigerator for 3 to 4 hours before serving. *Safety Tip One of the egg whites in this pie's topping remains uncooked. If you are concerned about the risk of foodborn illness, substitute liquid pasteurized egg whites (2 tablespoons per white).